This is the only rectangular Olympic medal and the first time Gold medals were issued. Although at these Olympics prizes varied by sport, with many athletes receiving trophies or various types, and some sports awarding up to 20 athletes. 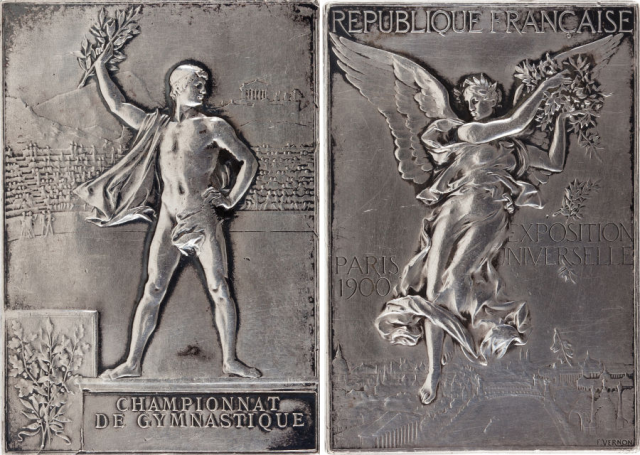 Obverse (front) – Relief of Nike (goddess of Victory) holding a wreath, inscriptions “Republiquie Francaise” “Paris 1900” “Exposition Universelle”. Reverse: Victorious athlete standing in front of a landscape.